The application by QApps displays a popup window that shows what has just been added to the shopping cart and offers a list of “You may also like…” products when a shopper clicks the “Add to cart” button. From the popup, your shoppers can add recommended products to the shopping cart, continue shopping, proceed to checkout. The application displays a popup window that shows what has just been added to the shopping cart and offers a list of “You may also like…” products when a shopper clicks the “Add to cart” button. 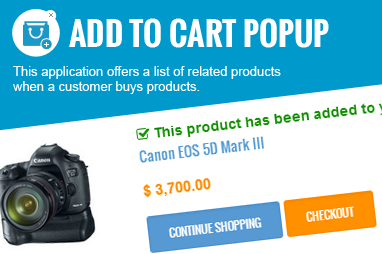 From the popup, your shoppers can add recommended products to the shopping cart, continue shopping, proceed to checkout. The Add To Cart Popup app is available for FREE for 7 days, then for the low monthly price of $7.95. Unlimited Plan: only $7.95 per month.